If you’ve reviewed the Money Guy site recently, you’ve probably noticed that we added a fun "widget" which rotates through some of Warren Buffett’s wiser observations about money, business, and life. Most of those quotes come directly from his annual letter to the shareholders of Berkshire Hathaway. Every February, I eagerly await its release because it provides insight into the mind of the most successful investor of our lifetime. Not only does he share what he thinks of the current economy, Buffett also discusses his investment portfolio and shares general life advice. Even better, there is also quite a bit of humor added to the annual letter. Just about all Americans came to believe that house prices would forever rise. That conviction made a borrower’s income and cash equity seem unimportant to lenders, who shoveled out money, confident that house price appreciation (HPA) would cure all problems. Today, our country is experiencing widespread pain because of that erroneous belief. As house prices fall, a huge amount of financial folly is being exposed. You only learn who has been swimming naked when the tide goes out – and what we are witnessing at some of our largest financial institutions is an ugly sight. On page 4 Warren says something that many shareholders will probably find troubling. Berkshire’s past record can’t be duplicated or even approached. Our base of assets and earning is now far too large for us to make outsized gains in the future. Either Warren really believes this or he is just being a good investment manager and keeping shareholder expectations in check as we approach a period of financial uncertainty. Either way it is a bold statement. A great business requires an enduring moat that protects excellent returns on invested capital. The dynamics of capitalism guarantee that competitors will repeatedly assault any business castle that is earning high returns. Warren also looks for businesses whose success does not depend on having a great manager. If a business requires a superstar to produce great results, the business itself cannot be deemed great. The worst sort of business is one that grows rapidly, requires significant capital to engender the growth, and then earns little or no money. Warren provides an example of a gruesome Industry… the U.S. airline industry. Warren Buffett came and spoke at the University of Georgia a number of years ago and someone asked him to recall his worst investment. He quickly replied US Air. At that speech he went on to explain why… too much volatility in earnings because of fuel prices and competition. You also can not take for granted the damage that can occur to your brand if a plan crashes or some other unforeseen hardship. In this year’s letter to shareholders Warren once again laments that bad decision of US Air. 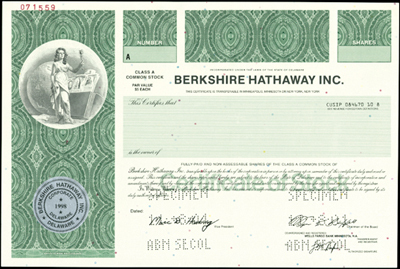 Berkshire has a large portfolio of traditional equity investments (examples include American Express, Anheuser-Busch, Coca Cola and Kraft Foods Inc.). What is interesting is the way that Warren evaluates performance for these holdings. Warren says, We do not measure the progress of our investments by what their market prices do during any given year. Rather, we evaluate their performance by the two methods we apply to the businesses we own. Americans like buying products made elsewhere more than the rest of the world likes buying products made in the US. Inevitably, that causes America to ship about $2 billion of IOUs and assets daily to the rest of the world. And over time, that puts pressure on the dollar. Warren also talks about how as a country we need to take responsibility for the recent influx of foreign investments, When we force-feed $2 billion daily to the rest of the world, they must invest in something here. Why should we complain when they choose stocks over bonds? I should mention that people who expect to earn 10% annually from equities during this century – envisioning that 2% of that will come from dividends and 8% from price appreciation -are implicitly forecasting a level of about 24,000,000 on the Dow by 2100. Whatever pension-cost surprises are in store for shareholders down the road, these jolts will be surpassed many times over by those experienced by taxpayers. Public pension promises are huge and, many cases, funding is woefully inadequate. Because the fuse on this time bomb is long, politicians flinch from inflicting tax pain, given that problems will only become apparent long after these officials have departed. This point from Mr. Buffett will once again support my recommendation of maxing out those ROTH accounts. There is no doubt that tax rates will increase as the population continues to age and the public liabilities increase. Warren closes out the letter with the following…. At 84 and 77, Charlie and I remain lucky beyond our dreams. We were born in America; had terrific parents who saw that we got good educations; have enjoyed wonderful families and great health; and came equipped with a business gene that allows us to prosper in a manner hugely disproportionate to that experienced by many people who contribute as much or more to our society’s well being. Moreover, we have long had jobs that we love, in which we are helped in countless ways by talented and cheerful associates. Every day is exciting to us; no wonder we tap-dance to work.